A little project I was working these days. Gotcha was the 3rd. arcade game made by Atari, released in 1973. A very rare color version was made and recently discovered by Ed Fries. This is the first color arcade game ever. Rules : The "square" player chases the "plus" player. Try to catch the plus simbol to earn points. It's a 2 player only game, I have plans to make an artificial intelligence for one player only. And the game is using CommaVid bankswitch just because I'm testing with this format, not the game really needs it. Edited by LS_Dracon, Wed Jan 16, 2019 7:23 AM. wow. neat. I didn't even realize there was a color arcade game before Galaxian. Nice fit for 2600 too. Thanks. There are others color games before Galaxian. 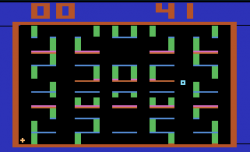 Exidy's Car Polo probably was the first color arcade game with microprocessor, to name one. Edited by LS_Dracon, Tue Jul 5, 2016 6:31 PM. Interesting game, never heard of it before. Looking forward to an AI version. If you implement both AIs, it will have a cool demo mode. BTW: The colors doesn't play any role in the game, right? Removed the black bars at corners. Press joystick button to restart the game or reset switch to reset anytime. This is the first maze game. The original have an attract mode, where the players bounce around like the pong ball, I still need to implement this. But I like your idea because shows the real gameplay. The colors doesn't affect the gameplay. In the arcade, each bar is draw using a particular color, all vertical bars are green, while the horizontal are blue, pink or red. Edited by LS_Dracon, Wed Jan 16, 2019 7:24 AM. I just played this latest version. I like it and it certainly works well on the 2600. We'll be featuring Color Gotcha on the ZeroPage Homebrew Twitch stream tomorrow (Wednesday) at 11AM PT/2PM ET! Hope everyone can tune in to watch us play! EDIT: Here's the video of the livestream! Edited by cimmerian, Thu Jan 17, 2019 3:08 PM. what the AI for im playing for 1 player rt now on stella and im using the up/down keys to chase around and find the plus symbol, isnt that what its supposed to do? Edited by chewy, Tue Jan 15, 2019 10:28 PM. There's no A.I., it's a 2 player game. So you abandoned your AI plans? And bounce the players around like pong ball during attract mode. I don't have plans to code AI anymore, sorry. This is really cool! Looking forward to seeing the attract mode with the players bouncing around like Pong. Even a quite simple AI might provide fun for a single player. what am i doing wrong here, i take the little thing and im following it to the maze-- just by myself-- how is it supposed to be played? It's a two player game where one person tries to catch the other before the time runs out. On the livestream we took turns for who chased and who got chased. There's not much to do in this game, it seems moving a object on a screen was entertaining enough for a commercial product back in 1973. Looks like they had fun playing it though - sometimes simpler is better. I'd rather play it than Fortnite. We had a lot of fun playing your game on the livestream, especially once we figured out a good strategy to hold a point competition by trading off who was doing the chasing. I think it's really important to port these forgotten arcade games as I had never heard about it before encountering your game. Great job on it! We definitely did! Some of the best (and most addictive) games are the simple ones that have great repeat value to return to them, especially head-to-head two player games! Gotcha may be a forgotten game, but played a important role at video game industry as being the first maze game ever, the PacMan grandpa. And the color version is the first time someone messed with RGB signal to display video game color graphics. Edited by LS_Dracon, Thu Jan 17, 2019 6:19 PM.